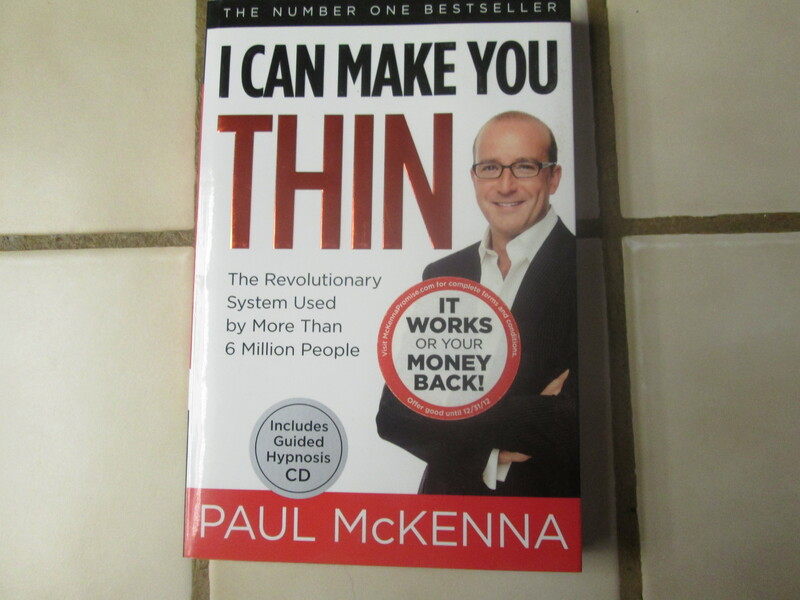 This month’s book is I Can Make You Thin, by Paul McKenna. I was introduced to McKenna’s method years ago when he appeared on a television show that shared the same name of his book. I found his method informative and useful and I have very little criticism of it. His method is simple. First, you can eat when you are hungry. Second, you can eat whatever you want. That’s right, you can eat whatever you want even high-carb food. Third and most important to his method is to enjoy your food. By enjoying your food he means to savor it by eating slowly. Eating it slowly is the real trick. Fourth and final is stop when you are satisfied. That is to say: Do not stuff yourself. This is no problem because if you are hungry again in five minutes, you can and should eat again. Just remember to eat slowly. What is exciting about this method is that you can eat anything. It takes the psychological fight to resist high-carb food out of the equation. Also, his suggestion to eat slowly is awesome. I remember when I tried this diet, I was eating high-carb food but not much of it. When I ate slowly and stopped as soon as I was satisfied, I was only eating about one third to half of what I normally would eat. Of course this was reducing my insulin and that was causing me to lose weight. Another genus aspect of McKenna’s method is his ability to give the reader commands without it sounding like a command. This is obviously an N. L. P. technique that he is implementing. An example of this is when he suggests savoring your food. He really wants you to eat slowly; however, he does not want to give the out-right command to do so. Whenever you give a command like that, the natural reaction is to resist. So he overcomes that psychological fight. The major flaw of his method, as I see it, is that in many cases it is unworkable for a large segment of the population. So here is an example from my personal life. I would wake up eat something I love. Eat slowly stop about half or one third of the way though my meal. The problem would be I would get hungry about thirty minutes to an hour later and I was not in a place where I could eat again. I was at work. I’m sure many people do not have jobs where their boss would let them eat every time they get hungry. As a result, I would get ravenous at lunch and it was very hard not to over eat. And I was over eating all those high-carb foods. The same process would repeat itself in the afternoon. Another problem is that this method is a carb-expensive plan. Or at least it can be a carb-expensive plan. I know I chose to eat (not all but) many high-carb foods when I was on this plan. Simply put, high-carb food is not good for you. It is not a healthy way to eat. I am all about the results. If someone can make this plan work, then that is awesome. That is to say, if someone can really get to their goal weight, and be healthy using this method, then use this method. Personally, I found it hard to manage and my body just does not interact well with high-carb food. 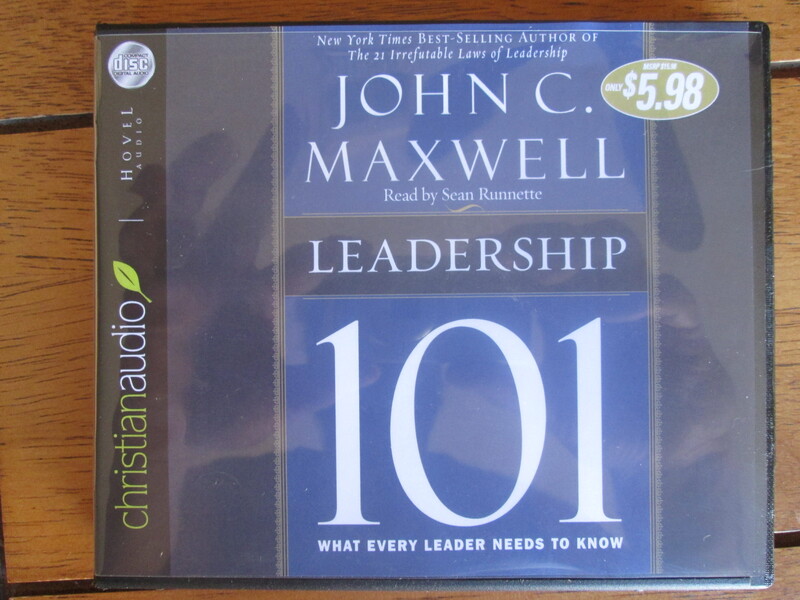 Our book for September though October is Leadership 101, by John C. Maxwell. This audio book was important to me because I am a heath coach. Leadership is a big part of my industry. If I cannot lead people to follow my advice, then I cannot help them reach and maintain their weight-loss goals. Bottom line I need to be a leader in health and fitness. For my clients, this will also be useful to many of you. You may need to be the leader of health in your sphere of influence. You may be the one who has to lead your family to make a healthy choice for dinner rather than breaking down and eating high-carb food. This book will help you be a leader in your life. I really liked how Maxwell defined what leadership is not, then defined what leadership is. Simply put leaders have followers.